I’m sorry to say that there’s not actually any connection between the thread and the gigantic pile of posses that were made in the Saloon, because most of those posses were me testing out what I could make, and I had no idea that forum even existed before now, haha. Most of these posses were just me messing around, but Dem Bois, Professional Funyuns and NOYB actually got used in a game between me and some of my friends. We… did not play particularly optimally, but it was fun! 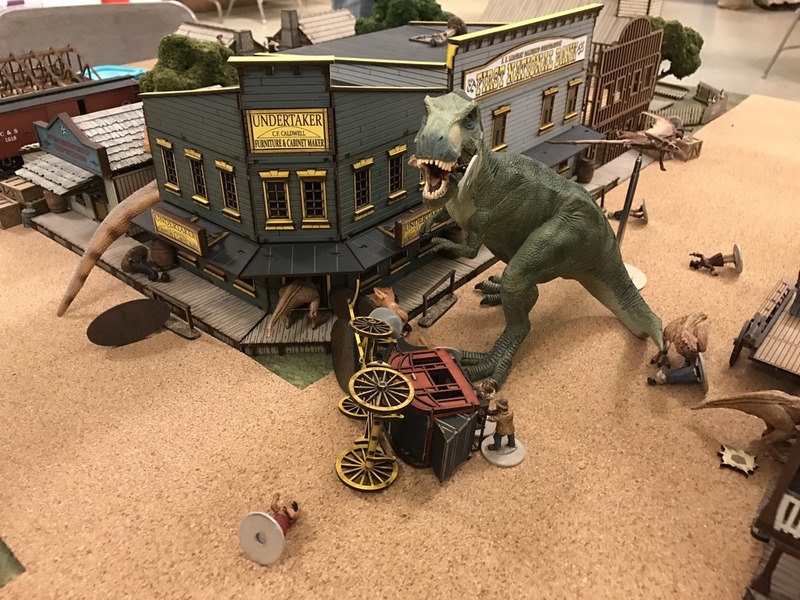 We scraped together a bunch of random objects for terrain and figurines (I had a pile of books for mountainous terrain, a turtle figurine for an Armored dino, and a rubber duck for the Ducky, and my friends brought some Star Wars figurines, Pokemon figures and a bunch of army men). In retrospect, I might have overdone the terrain for a first game, but that might have been partially because of some slapdash objective and terrain feature placement, since I didn’t want to take too long getting the game set up. The biggest problem was probably that I placed all but one objective on high terrain, thus making it really hard to claim objectives once someone’s set up… and one of the four had a healing spring near it represented by a Pompeii snowglobe, which ended up costing me the game in the long run. (The more I describe this, the more I wish I had taken pictures…). The board was also 2.5 x 5 feet, which meant that NOYB, being on the long side, was both flanked and had more board access. I’m not sure if that was a major issue, but it did mean we made the game a little longer just to get into position. Our team plans were as follows: Dem Bois (my posse) was trying to be a more generalist posse focused on quality over quantity, the Funyuns decided to just swarm the board with a fast, cheap dino to cover terrain with a bunch of their units, and NOYB decided dinos were for cowards and just bought bigger guns, which I can’t say was an entirely bad idea looking at how well that gatling gun worked. The Funyuns did pretty well once they got going, although NOYB ended up making half their posse stall out on the lower level, since he didn’t want to expose them to Gatling Gun Han Solo (Boxer Palpatine got blown away first turn by a lucky roll). Two figures I don’t remember the stats of (but who were represented by Leia and Greedo) were put on the Ducky and starting rushing for the Hot Spring objective, though, which ended up giving them a major advantage, while NOYB claimed an objective on a choice shooting spot. On the other side of the board, Dem Bois ended up blowing away half of NOYB with the Bronto Gun and the leader with the Carbine, getting both members on that side (including their leader, represented by Chewbacca) to flee and get Taken Out one at a time, and ended up costing NOYB the win, since that was on turn 5 of 7 and his entire remaining Posse failed their Bravery rolls. Myrtle the Turtle did a little bit of dancing between cover with Sprint to help that out; in retrospect, though, maybe Myrtle would have been better as mobile cover than as a mount. on the objective I fought with NOYB over. It was a bit of a mess – I’m gonna go lighter on terrain next time – but it was fun! Awesome reply! Apologies for not responding earlier, my second kid was literally born a few days before so Dec was swamped beyond belief. I do tend to post in spurts of bustling activity, but even in the quiet periods Dinosaur Cowboys crosses my mind daily, and I’m always ready to chat about the game. Sounds like you had a really fun time! The text books as hills, random figures, and chaotic terrain setup reminds me of my youth playing tabletop games. Really glad to hear that magic is still alive and my rules could help you with it. You definitely should have taken pictures :) Great fight recap, and from the looks of things you used the features very well (like healing spring). Definitely feel free to tweak as desired for board size, if you’re doing a 5′ table the movement speeds would be too low in most cases. Or if you’re finding big stacks of books tedious to hike up you could houserule everyone to have the “Climber” trait (ignore Difficult Terrain for hills). Lots of ways to modify the game to fit your group and personal setup. For sure let me know if you play again! I’m always eager to host fan photos and stories. « Project status, aka what have I done for 8 months?